The magic of summer nights comes alive with outdoor music in the N.C. mountains of Jackson County. Make memories dancing barefoot on a lawn. Bask in the sweet mountain air of a summer evening. Wish on the first star as strains of music drift into the night. 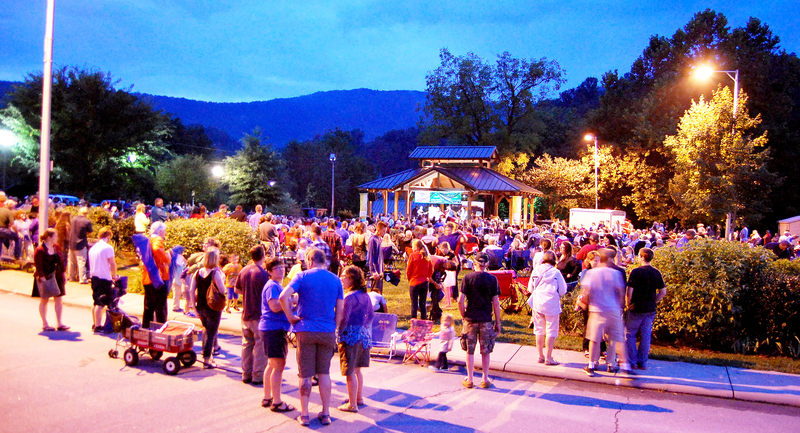 Outdoor concerts are a hallmark of summer here in Jackson County, N.C. Every Friday night, we serve up the double header of Concerts on the Creek in Sylva and Groovin’ on the Green in Cashiers. The two bucolic venues — with timber-framed open-air stages, expansive lawns and a mountain backdrop — bookend Jackson County, so no matter where you land at sundown, you won’t be far from the tunes. The crowd-pleasing line-up crosses many genres: Appalachian bluegrass, folk and roots, Americana, groovin’ jazz, country rock, laid-back funk, and lively pop hits. Bands are hand-curated for their crowd-pleasing sound. The best part? It’s all free. Got kids in tow? Make memories with an impromptu family dance party in the great wide open. Or let them frolic and run free in the cool summer grass — lightning bugs anyone? — while you steal a rare moment of adult convo. Traveling with pets? Four-legged companions are always welcome on leashes. Locals love their summer music here in Jackson County. It’s our chance to unwind from the week, catch up with neighbors and make new friends. There’s plenty of camaraderie to go around, so grab a blanket or lawn chair and nestle in. A picnic supper is the perfect pairing with an evening of outdoor music. Plan your menu with these top picks for mountain picnic fare on-the-go. Our outdoor music venues are a stone’s throw from the restaurants of Sylva, Dillsboro or Cashiers. Grab a bite before the show or graze on local food trucks that often make an appearance. When the music winds down, follow the after party uptown. Find your niche among the nightlife scene of cocktail lounges, wine bars, coffee shops and breweries. We do classy, too. Top-notch chamber music takes the stage two nights a week in Cashiers, with 10 visiting ensembles during a five-week run. Generations gone by, mountain folks gathered on their front porches with fiddles and banjos to wile away the summer evenings. Outdoor music concerts are our way of carrying on that tradition. So, let your hair down, kick your heels up and Play On. What: A laid-back vibe at a downtown park that sits alongside…you guessed it, a creek. When: 7 to 9 p.m. every Friday, Memorial Day through Labor Day. Where: Bridge Park in downtown Sylva, 76 Railroad Ave.
Tidbits: A timber-frame gazebo over the stage evokes imagery of mountain peaks in its architecture. A gorgeous arched footbridge — the namesake for Bridge Park — leads over Scott’s Creek to a sprawling, whimsical wooden playground. More information is online here. What: A festive summer night is in store at this immense garden-esque park setting. Where: The Village Green Commons in Cashiers, at the crossroads of U.S. 64 and N.C. 107. Tidbits: The Village Green is like an island in the sky on the Cashiers Plateau. Stroll the manicured paths and native gardens, ponder the outdoor sculpture collection and turns the kids loose on a fantasy playground with castle turrets and wooden bridges. www.villagegreencashiersnc.com or 828.743.3434. What: Experience the haunting and stirring melodies of 10 visiting chamber music ensembles during a five-week run. When: 5 p.m. every Saturday and Monday from July 7 through August 6. Where: Auditorium at the Cashiers Library, 249 Frank Allen Road. Tidbits: Now in its 35th year, the chamber music season is a Cashiers classic. The impressive series brings in professional musicians from across the county. Each performance features a different triplet, quintet or sextet with violins, cellos and piano. Tickets are $35. 828-526-9060 or www.h-cmusicfestival.org. July 7: Sibling Rivalry – Triple Trouble!